Michael was born and raised in Phoenix, AZ. Michael was a short sprinter in college at a small Division II school in western Nebraska called Chadron State College. During his time at Chadron he earn several All-Conference honors as well as becoming an NCAA All-American placing at the National Meet in the 200 meters. After receiving his Bachelor’s Degree in Education he moved on to Adams State College in southern Colorado to become a Graduate Assistant Coach with the track and field program. While at Adams State he was responsible for writing the in and out of season training programs for the sprints, jumps, and hurdle groups; including strength training, technical training, and conditioning. During his time at Adams State he coached several NCAA National Champions, over 20 NCAA All-Americans, and was part of a team NCAA Division II Indoor Track and Field National Championship. After graduating with his Master Degree in Sports Administration he returned to his home state landing a teaching and coaching job at Catalina Foothills High School in Tucson, AZ. Michael has been a Physical Education and Health Teacher at Catalina Foothills since 2012. He is also the Head Track and Field and Head Girls Cross Country coach at Catalina Foothills and has even coached Girls Basketball for a few seasons. Since he started coaching at Foothills he has won 3 State Titles, Coached 5 individual State Champions, and has been named the Southern Arizona Coach of the Year 3 times for Cross Country and Track and Field. 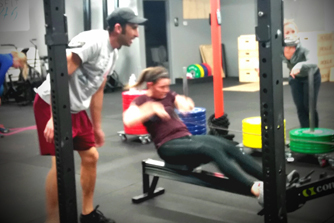 Michael has been a member at CrossFit 646 for several years after his wife introduced him to Matt and Mel. Michael loves how CrossFit trains him not only physically but mentally which is very similar to his track and field and running backgrounds. He also enjoys how CrossFit prepares people for functional movements and whatever life might throw at you. When Michael is not at the gym he enjoys spending time with his wife RoseMarie and their 2 dogs Jeter and Miles.